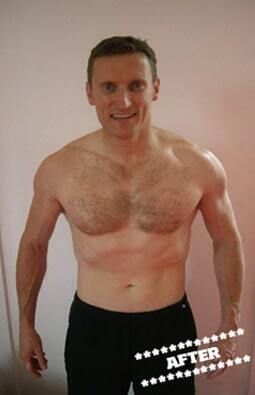 Stephen shed 3 stone in 4 months and dropped his body fat to 8%. Stephen says, "it's not an exaggeration to say my life changed for the better the day I met Davie." My own DMC journey started in Oct 2009, when I was tipping the scales at nearly 16 stones, which was easily the heaviest I had ever been. I was really pretty miserable with my body condition but didn’t have any idea how to go about making a change. It just seemed so unlikely that i would be able to make any real difference and It was easier to just ignore the problem and hope it would somehow work itself out. Obviously that didn’t work as you don’t get what you want, you get what you work for! Eventually I decided enough was enough and after being introduced to Davie by a friend, I proceeded to lose nearly 3 stones in weight within the first 12 months of training with him. The training programmes were always really varied and included bodyweight, kettlebell and boxing routines which allowed for continual progression and development as my conditioning and strength improved. Just as important was the nutritional advice Davie passed onto me. I learned that there was little point in putting myself through punishing training regimes if I was going to undo all the good work with an unhealthy diet. I still have a big appetite but now try and eat more of the right food types. Eventually I got my body fat level down to 8%, which is pretty lean for a 41 yr old. It’s not always been plain sailing though and occasionally I have to pull back from training on account of a long term back problem. I had an operation on a slipped disc around 15 yrs ago and now and again it flares up and causes quite a bit of back and leg pain. When this happens I work closely with Davie and with the right stretching and extended mobility work the rehab times are generally pretty short and I can return to training again. Davie has always been careful to work around my back issues and creates bespoke regimes which help to strengthen my back without aggravating the problem. When Davie started up the Glasgow Kettlebell Club (GKC), I really enjoyed being involved and we regularly took part in Kettlebell Competitions around the country. This also gave me an opportunity to let my competitive nature come out to play! For me getting fit was actually relatively easy, once I got started. The much harder part was maintaining it. A lot of people manage to lose large amounts of weight through sometimes quite radical or extreme diets , however, it can be very difficult to avoid the dreaded rebound. With Davies help and advice I have been able to stay in pretty decent shape for the past 3 and a half years and I still feel determined to make further improvements and achieve new fitness goals all the time. With Davie and the rest of the DMC team constantly encouraging me and pushing me on I genuinely feel I will reach new levels of fitness this year and hopefully long into the future.